One hears it said that everyone has a novel in them. Of course everyone has a life story. But the idea of a novel inside, waiting to be poured onto the page as one might pour tea into one's cup? Even prolific novelists don't have that. The novel isn't in there. It only emerges as the writer offers thoughts up to paper or a computer screen, reads them, finds they weren't yet the thoughts that would make the piece go, changes them, and iterates round this thinking circle many times. What the novel needs is thinking. Writing on paper has provided a way of augmenting thinking so that one's thoughts can not only be communicated to others, but also to oneself. In the communication to oneself the thoughts can be improved, extended, projected into areas that otherwise one would never have considered. 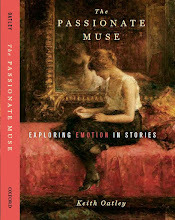 The prose writer who seems first to have grasped this idea explicitly, and turned it into a method, was Gustave Flaubert; his method of writing-as-thinking as widely and deeply as possible in the construction of a story was described in an OnFiction post of 16 February 2009 (click here). 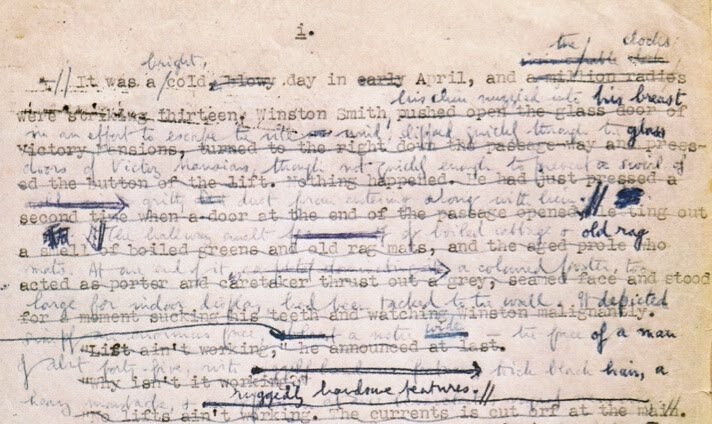 The effect of iteration round the drafting circle is that the topics of the writing—characters, events, thoughts, verbal expressions—have been thought about deeply. A poet can spend weeks on a fourteen-line sonnet. A writer of short-stories can take months to write a ten-page story. A novelist can take years to write a novel. So unlike a paragraph in a newspaper, or a news snippet, or many of the pieces one reads on the internet, the subject of such application by an imaginative writer has been thought about all the way down to its fundamentals. This fact alone can separate many books from some of the ephemera of the internet. But what enables a writer to spend all this time thinking on a single subject? 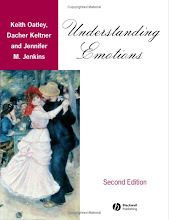 Maja Djikic, Jordan Peterson, and I (2006) explored the idea that it's the emotions, particularly unresolved emotions which provide the motivation to keep iterating round the circle of externalizing and internalizing thoughts (see our article in the Archive of Academic Papers). Phil Johnson-Laird and colleagues have recently shown that people with certain kinds of mental illness, for instance of anxiety states and depression, are not disordered in their thinking about the emotional issues of their illness (see for instance, Johnson-Laird in How we reason, 2006). They actually think better than normal people on these emotional issues. That is to say when offered a problem that has to do with the particular emotion which is at the centre of their condition (for instance anxiety or depression), they construct a larger array of mental models, and make better inferences. By contrast people who are not suffering from an emotional problem, tend to make more mistakes because they do not explore sufficient possibilities of a problem, and they tend stop too soon. According to these results, an emotional disorder does not occur because sufferers are thinking in a distorted way about their problem. Their thinking is not distorted. It is excessive. It occurred to me recently that writing has some qualities of people in anxiety states, depression etc. Like the person with an emotional disorder, the writer thinks long and hard about an issue's emotional implications. Drawing on the augmentation provided by paper, the writer turns this obsessional thinking not into an illness but into a work of art. Philip Johnson-Laird (2006). How we reason. Oxford: Oxford University Press. 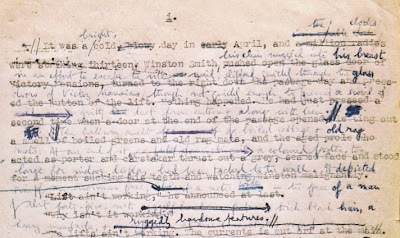 Image: A near-final draft by George Orwell, of his 1984, in which he finally achieves his famous first line: "It was a bright cold day in April, and the clocks were striking thirteen." Everyone has a bad novel in them. Thank you, Brian, for this. Perhaps you are right. That's why the bad novel needs to be put out there, on paper, where it can be made better. What you describe as "iterating round the circle of externalizing and internalizing thoughts", the DSM-IV describes as rumination and is a fair description of how many if not most severely depressed people process their thoughts. But I'm leery of this generalization: "They actually think better than normal people on these emotional issues." 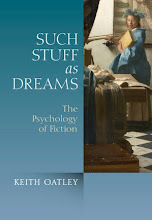 Practitioners of CBT would suggest that all depressed people have distorted thought processes. Perhaps your statement needs to be qualified to reflect the fact that depression and anxiety occur on a spectrum. Some people are so ill they can barely think at all. Others who are diagnosed as depressed suffer little cognitive impairment during the course of their illness. So, for example, William Styron, who is one of the subjects of your study, would probably have been a useless subject when his illness was most acute, yet his book Darkness Visible is a valuable reflection on his art and his illness. I think your claim is only true for those who experience sufficient periods of relative good health that they can successfully engage that "circle of externalizing and internalizing thoughts". Styron could sit down afterwards and reflect deeply upon what he had experienced. Because your sample of writers only considers successful writers, the "thinking better than normal people" claim seems overbroad and perhaps perpetuates a romanticized view of mental illness. Speaking from personal experience, it's a view that needs to be buried. It's what I would describe as the "sunny side" of stigma. But it's still a stigma. Thank you very much, David, for your thoughtful comment. I agree with much of what you say, that people in a dire states of depression seem almost unable to think at all. So I agree there is probably a spectrum. But I am not romanticizing; mental illness is a terrible affliction. 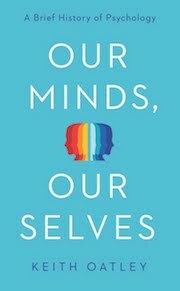 I was drawing on a rather striking finding by Phil Johnson-Laird, Francesco Mancini, and Amelia Gangemi (2006) that people who have psychiatric diagnoses of emotional disorders reason better, that is to say, more accurately about problems that involve the emotional issue of their illness than do people who are not psychiatrically ill. The mentally ill people are very persistent in their thinking about their problems, and this contributes to their superior accuracy at reaching conclusions. It was this finding, and some subsequent findings by this group, that prompted in me the thought that perhaps the persistence a writer needs to iterate repeatedly round the circle of drafting and re-drafting might be related to this phenomenon. Although you mention that practitioners of cognitive behavioural therapy (CBT) suggest that depressed people have distorted thought processes, Johnson-Laird (one of the foremost researchers on the psychology of reasoning) found no evidence of such distortion. What started me on this line of thought is that I am writing a short story at the moment, and am finding it hard to keep at it. It occurred to me that I am not sufficiently emotionally engaged. So, I am sorry if I overstated the phenomenon, and thanks for your remarks about William Styron, but I think there might be something in this. Here's the Johnson-Laird et al. reference, which you might find of interest. Johnson-Laird, P. N., Mancini, F., & Gangemi, A. (2006). A hyper-emotion theory of psychological illnesses. Psychological Review, 113, 822-841. "It's the emotions" is very true to my experience as a novelist, what keeps me going ... but how quickly this seems to morph, in the post, into "people with certain kinds of mental illness." Which is it, talent/skill or illness? And who is drawing these dubious lines anyway? And various other similar questions ... I take no personal offense, but find these ideas put forth ... curious.